Cast your vote for our CEO, Rick Lane, as Technologist of the Year. 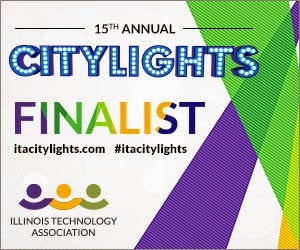 Our CEO, Rick Lane, has been named a finalist in the Illinois Technology Association (ITA) CityLIGHTS Awards. He is up for Technologist of the Year, which recognizes the individual whose talent has championed true technology innovation. Rick has been innovating with technology his whole career. He began at Booz Allen Hamilton, where he developed defense-analysis software for the U.S. Department of Defense and other government agencies. He went on to write trading algorithms at a proprietary trading firm before co-founding TickIt Trading Systems. At TickIt, he democratized automated trading when he architected the industry’s first visual programming platform, ADL® (Algo Design Lab). Rick joined TT in 2010 when we acquired TickIt, and he led the integration of ADL into X_TRADER®. He took a brief hiatus from TT to work for Google in New York before returning to become TT’s CTO in 2012. Rick was named CEO in February. Today, his vision and leadership are driving the development of a next-generation trading platform that will use the software-as-a-service (SaaS) delivery model to provide professional traders with secure, high-performance, go-anywhere market access and trade execution. Watch this space and follow @Trading_Tech on Twitter for more about that next month. From our new trading platform, to our new logo and office space, to encouraging employees to apply trading applications to wearable technology, Rick has been at the heart of TT’s recent technology innovation. His enthusiasm for technology has not only impacted TT, but also the trading industry. In fact, we’ve highlighted innovation several times in this blog. The Technologist of the Year will be chosen by a composite score (50% judges; 50% community voting) and announced at the CityLIGHTS awards gala in Chicago on September 18. TT colleagues across the globe will be voting for Rick. If you are so inclined, we would appreciate your support, too. Voting closes at 5pm CDT on September 8.